Irish Clans are traditional kinship groups and many people of Irish descent are all over the world. So many always want to check back to the people from which they originally came and Ireland has a rich history of these kinship groups. These “clans” traced their origins to larger pre-irish surnames population groupings such as Uí Briúin in Connacht, Dál gCais in Thomond, Eóghanachta in Munster, Uí Néill in Ulster , and Fir Domnann in Leinster. From ancient times Irish society was organised around traditional kinship groups. Within these larger groupings there tended to be one Irish clan name who through war and politics became more powerful than others for a period of time and the leaders of some were accorded the status of royalty in Gaelic Ireland. Some of the more important Irish clan names to achieve this power were Ó Conor in Connacht, Ó Brien in Thomond, MacCarthy in Desmond,Ó Neill of Tir Eógain in Ulster and Kavanagh in Leinster. The largely symbolic and somewhat mythological role of Ard Rí or High King tended to rotate among the leaders of the main royal clans. Each distinct family group was led by its own Ceann Fine or “head of family”. The larger or more important clans were led by a Taoiseach or Chief while the smaller and more dependent clan names were led by Chieftains. Even the most humble, with the title ‘Bó-Aire’ or ‘chieftain of a single cow’, was entitled to be recognized as a leader of his own family. Under Brehon Law the leaders were acclaimed by their kinsmen as custodians of the clan and were responsible for maintaining and protecting the clan and its property. This clan system formed the basis of society in Ireland up to the 17th century.Scholars sometimes disagree about whether it is better to use the terms "sept" or "clan" when referring to traditional Irish kinship groups. The late Edward MacLysaght suggested the English word 'sept' be used in place of the word 'clan' with regards to the historical social structure in Ireland, so as to differentiate it from the centralized Scottish clan system. This would imply that Ireland possessed no formalised clan system,which is not wholly accurate. Brehon Law, the ancient legal system of Ireland clearly defined the clan system in pre-Norman Ireland, which collapsed after the Tudor Conquest. Furthermore, the Irish, when speaking of themselves, employed their term 'clan' which means "family" in Irish. Often, clans are thought of as based on blood kinship alone; in fact Irish clans would be better thought of as akin to the modern-day corporation (Nicholls, 2003). Their ruling structure, whether ruled by a single lord or a council, changed according to needs and the qualities of their membership. As with a modern corporation, the power of clans grew and shrank. Once-powerful clans could in time decline in stature and be amalgamated into once-smaller ones. How this "merger" would be dealt with would be a matter of negotiation based on the respective power of each party. Consequently, Irish clans were composed of those who were related by blood but also by those who were adopted and fostered into the clan as well as those who joined the clan for strategic reasons such as safety or combining of lands and resources. However, all members of the clan bore the same surname. The early 17th century was a watershed in Ireland. It marked the destruction of Ireland's ancient Gaelic aristocracy following the Tudor re-conquest and cleared the way for the Plantation of Ulster. In 1607 the senior Gaelic Chiefs of Ulster (Ó Neill, Ó Donnell and Maguire) left Ireland to recruit support in Spain but they never reached their intended destination and instead remained exiled. After this so called “Flight of the Earls”, the English authorities in Dublin established real control over all of Ireland for the first time. They brought a centralised government to the entire island and successfully disarmed the native clans and their Chiefs. However, despite the loss of their traditional lands and forced emigration into the service of Catholic monarchs across Europe, the spirit of the clans remains through the use of Irish surnames which are the mark of Clan membership. To this day Irish people in Ireland and around the world can tell you the name of the clan to which they belong. The growing influence of the Gaelic League at the turn of the 20th century rekindled an interest in Gaelic culture and prompted a cultural revival. In the 1940s Chief Herald of Ireland, Edward MacLysaght , drew up a list of Irish Clans and the first modern Irish Clans were re-formed in the latter half of the 20th century. Today, these clans are organised in Ireland and in every continent around the world. 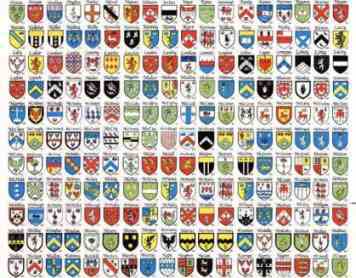 Except for a few individual exceptions there is no such thing as a coat of arms for a surname. Coats of arms are granted to individuals, not families or surnames. A form of property, coats of arms may rightfully be used only by the uninterrupted male line descendants of the person to whom the coat of arms was originally granted.